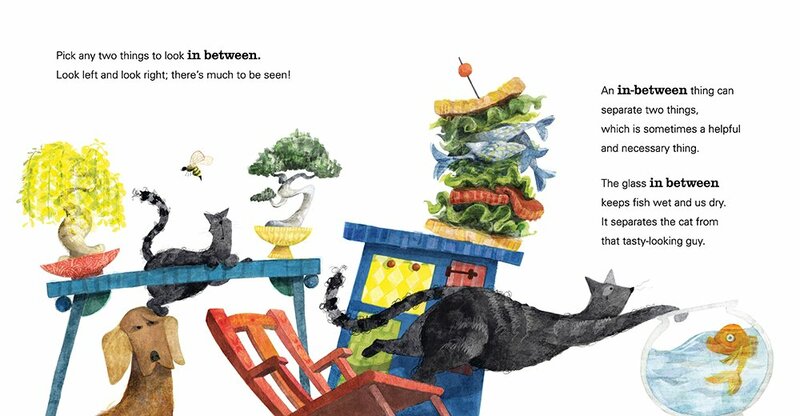 Look over there — the cat is between a table and a chair with a tear. But now look again: the cat is on top of the dog, who’s between the floor and the cat (and not too happy about that!). As you wander through the delightfully detailed illustrations, the more you look, the more you’ll see — including colors made from a mix of two others, hybrid implements such as a spork, warm nooks that are neither too cold nor too hot, even a cross of a zebra and cow that makes a . . . zebrow? 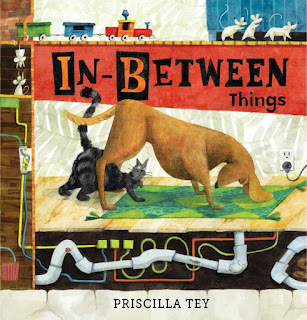 In an engaging and utterly stylish debut, rising star Priscilla Tey leads readers on an addictive exploration of the in-between, a surprisingly far-reaching and everywhere concept. "An in-between thing can separate two things, which is sometimes a helpful and necessary thing. The glass in between keeps fish wet and us dry. It separates the cat from the tasty-looking guy." For a book to explain a word in a way that's so entertaining and catchy, In Between Things is a definite favorite of all the children books I've ever reviewed. 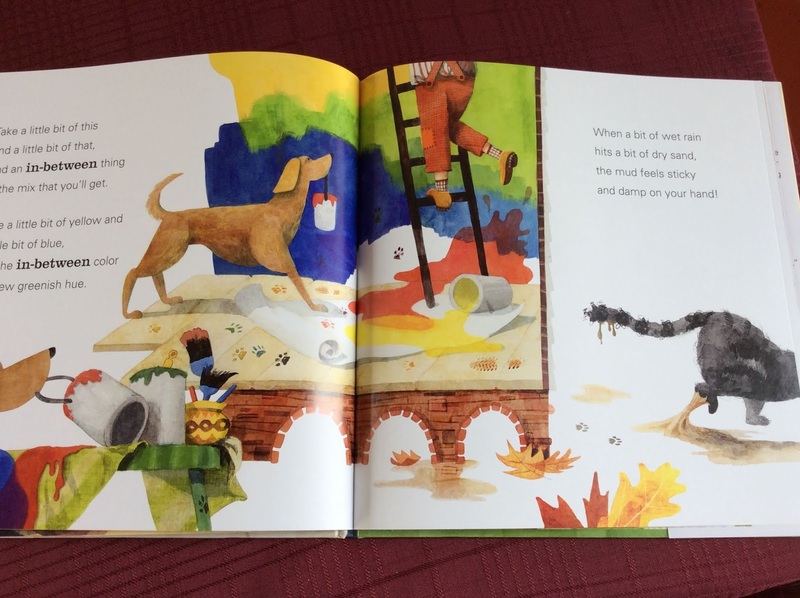 It's a book that I wouldn't mind reading over and over to a young child. Note to the author: Please make more books like this! 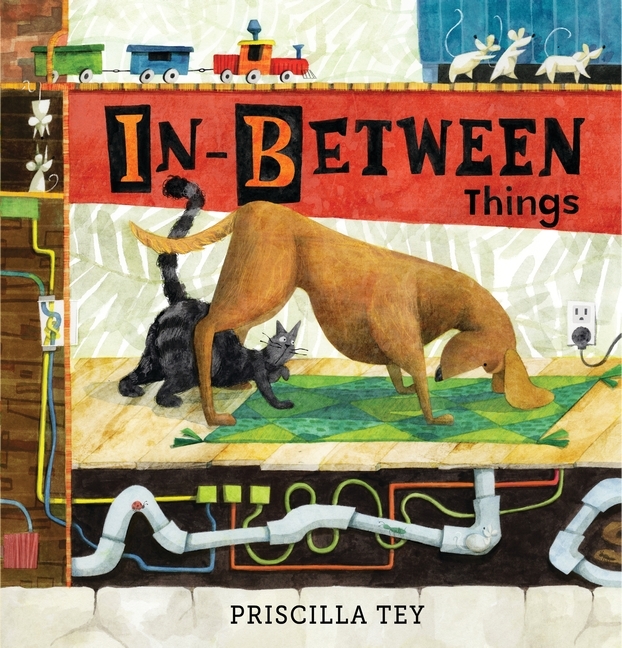 One person will win a hardback book copy of In Between Things. I am more of a dog lover. I"m more of a dog person. I am a dog person but I will take a cat too. I am definitely a dog lover! I am most definitely a cat person. We have three! Team cat all the way. I am a cat person for many reason. BUT I did take in one of my brothers german shepards for a year while they were building their home. More of a dog person, but I like both. I love both but I love cats more because they are low maintenance. I am a cat person, but our family has 2 cats and a dog! More of a Dog Person, but love cats too. I'm more of a dog person, although I love all animals. I had both dogs & cats growing up, but my hubby is not fond of cats. I love animals but dogs are my favorite. I'm definitely a dog person. I consider myself a dog person. I have, and love, both, but I am more of a dog person. i am a dog person. i love both though. I am definitely a dog person! I like cats, but I am a dog person. I'm a car person, but growing up we always had dogs. I like both but I own more dogs right now. I am a dog person most definitely. I am a dog person for sure, have been all my life. I love dogs! I am definitely a dog person. I do like cats too. I love both, but I'm more of a cat person. I would have to say I'm a dog person but I also love cats. Raised a dog person in a hunting family. I'm more of a dog kind of person!